Intricate paisley, whimsical nature scenes, lush animal prints. 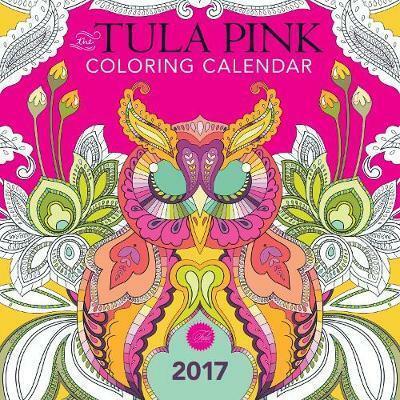 This is what Tula Pink's designs are known for--and now you can add your own touch to her distinct style in The Tula Pink 2017 Wall Calendar. Each month features an intricate illustration that invites you to express yourself using your own unique palette to decorate the designs. Get lost in a floral pattern or make a hummingbird fly off the page with an unexpected combination of reds and pinks. There are no wrong answers here. And all month long, you'll enjoy your colorful and creative wall decor! Author of bestselling Quilts from the House of Tula Pink and Tula Pink's City Sampler, Tula Pink has become an icon of the fabric and quilt world. Tula's signature designs have been adapted to fabrics, woven ribbons, paper products, needlepoint kits, embroidery patterns, and even a signature sewing machine. Tula is known for her dark sense of humor, a flair for hiding animals in the strangest of places (artistically, not literally), and her boldly unique use of color and pattern. Tula lives in St. Joseph, Missouri.